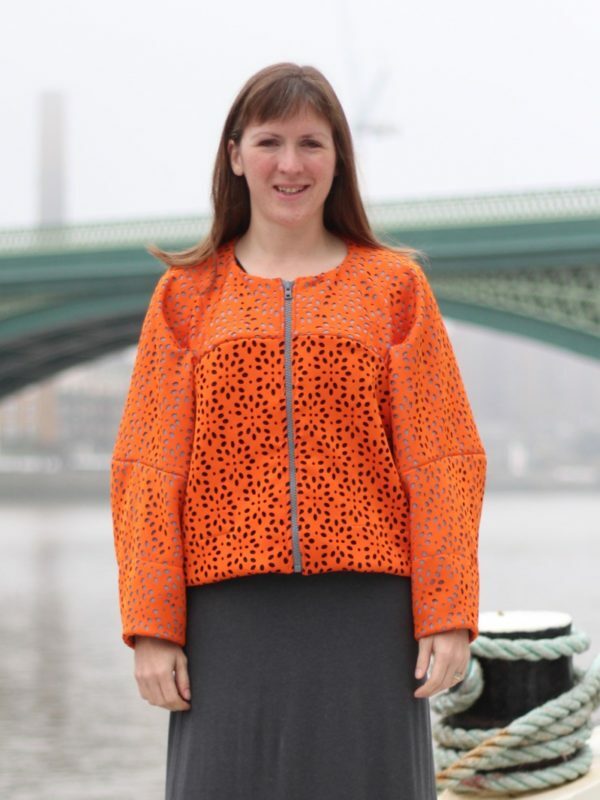 Rosie (of DIY Couture fame) created the “Sew Dots, Raise Lots” campaign for the month of October to raise money for the RNIB (Royal National Institute Of Blind People). 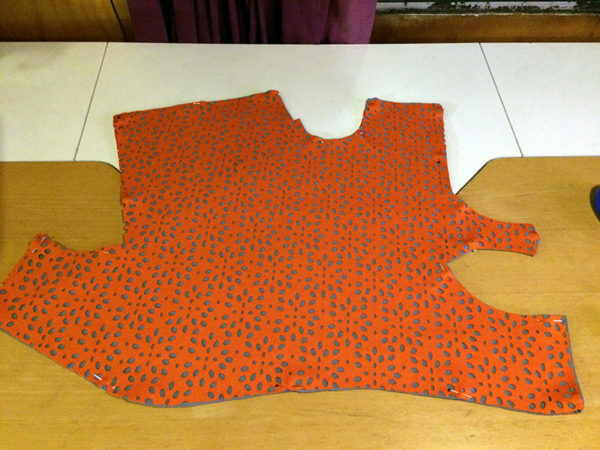 The premise was simple – sew something with polka dots (because it looks like Braille! 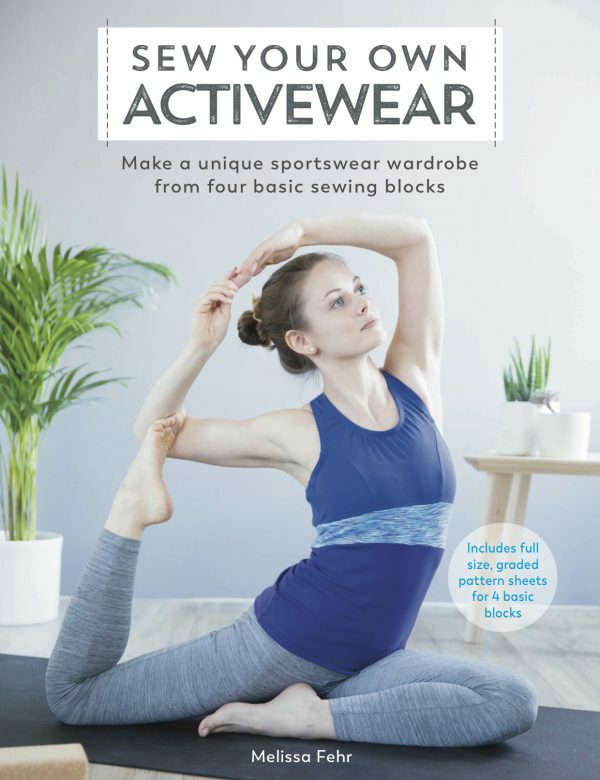 ), donate to the RNIB, and share on social media with the #sewdots hashtag to be in the running for a huge prize mountain. 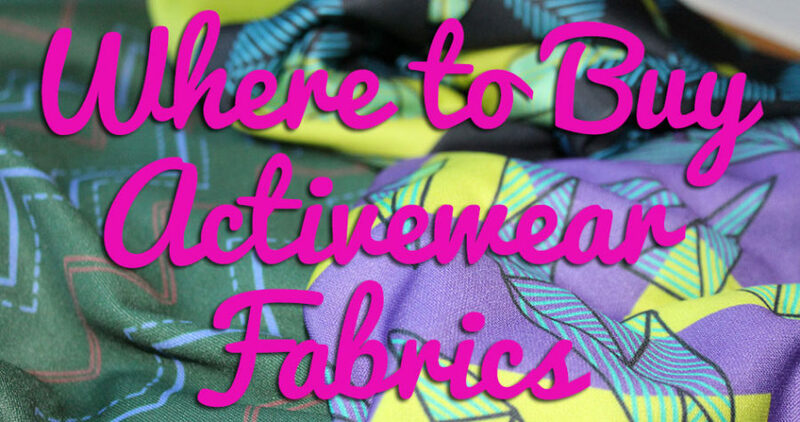 Since I didn’t have any dotty fabric in my stash, I kept an eye open for something suitable on my recent trip to Goldhawk Road to buy supplies for my jazzercise costume, and saw a bunch of laser cut scuba at Fabric House for £6/m. 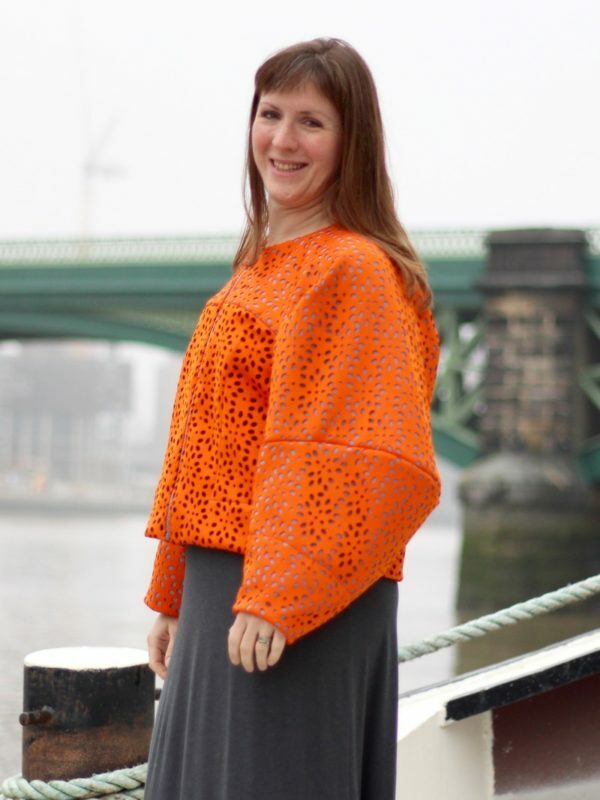 I bought a metre of the orange colourway, thinking I could layer it over some leftover grey scuba in my stash (leftover from the triple triangle dress) for a simple skirt. 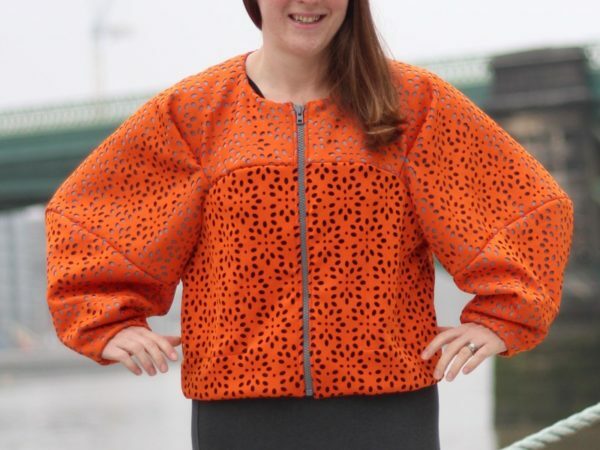 But once I got it home, I realised that it really wanted to be a jacket instead! I had a sporty, zippered jacket in mind, but I didn’t have any suitable patterns and didn’t fancy drafting anything, so I was a bit stuck… But then I remembered the incredible Pattern Fantastique “Falda Jacket” that had been burning a hole in my To Sew List ever since I first laid eyes on it earlier this year and I thought the double layer scuba would give those sleeves the structure they need to stand out. So I bought it, pieced together the pattern, and then realised that I didn’t have enough grey scuba left for the entire jacket (even if I did the facings in a different fabric it wasn’t enough!). So I compromised and underlined the lower body pieces in some leftover black scuba in my stash instead (leftover from the Travel Trio 3 skirt I wear pretty much continuously). Thankfully, I managed to squeeze all the necessary pieces from the wide laser cut scuba, though I did have to place both sleeve pieces on the cross grain in order to make it fit (since they don’t require stretch and the laser cut pattern was pretty bonkers anyway, you can’t even tell). 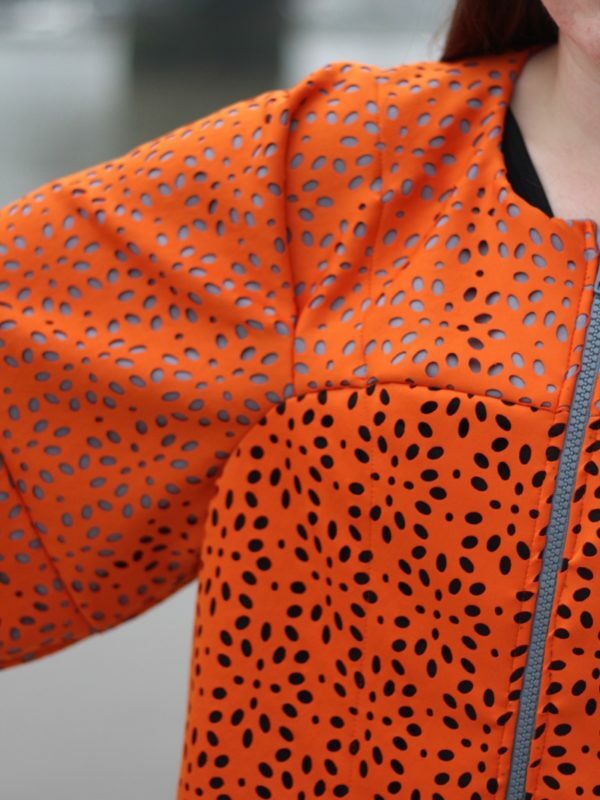 Speaking of the sleeves… you’re either going to love them or hate them, and I freaking adore them! They’re what drew me to this pattern in the first place, and the pattern piece for the upper sleeve (which is also the front and back yoke/shoulder) is just INSANE. I love it! I mean, I haven’t had a pattern piece make me think WTF in a long, long time, and this sort of weird 3D spatial stuff is my absolute favourite part of sewing. Outside of a Vogue DKNY designer pattern or my Madame Vionnet book, I don’t think I’ve seen a pattern piece this weird ever (well, okay, except maybe my own Steeplechase Leggings!). Bravo!! The pattern instructions were thankfully great, because there were certainly a few points where I had to fold and twist the pieces around a bit before I could get them to match the illustrations, but it all came together beautifully. This is certainly not a pattern to sew with a glass of wine by your side – you really need your full concentration! There are two main options for this pattern – one is unlined with lots of topstitching and patch pockets, and the other is fully lined with welt pockets in front. I wanted to keep a balance between simplicity of design (because bright orange laser cut and draped, bulbous sleeves is frankly distracting enough to the eye) and keeping those layers from shifting around too much, so I went the topstitching route (with a few variations) but left off the pockets to keep the fronts visually uninterrupted. And also because I didn’t have enough orange scuba left to squeeze the patch pockets in! 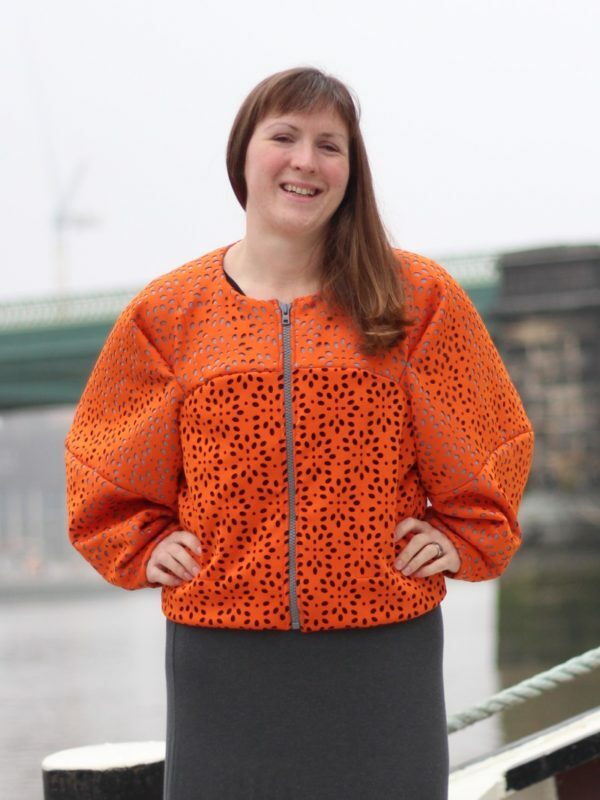 Even though I thoroughly enjoyed the process of making this pattern and I love the shape and fit of the finished jacket, I wasn’t entirely sure whether I liked it with this fabric combo while I was sewing it, or indeed even after I finished it. Once I’d finished sewing the major body seams (minus the zipper as I had to wait til Gertie’s Raystitch book signing to buy that) I asked James and another friend their opinion whether it worked or just made me look like the Great Pumpkin, and I was shocked at how enthusiastic they were. And then another friend started quoting off a few Dutch designers he thought it invoked, and others still actually thought it was designer. And I’ll be honest, the more I wear it, the more I’m warming to it. 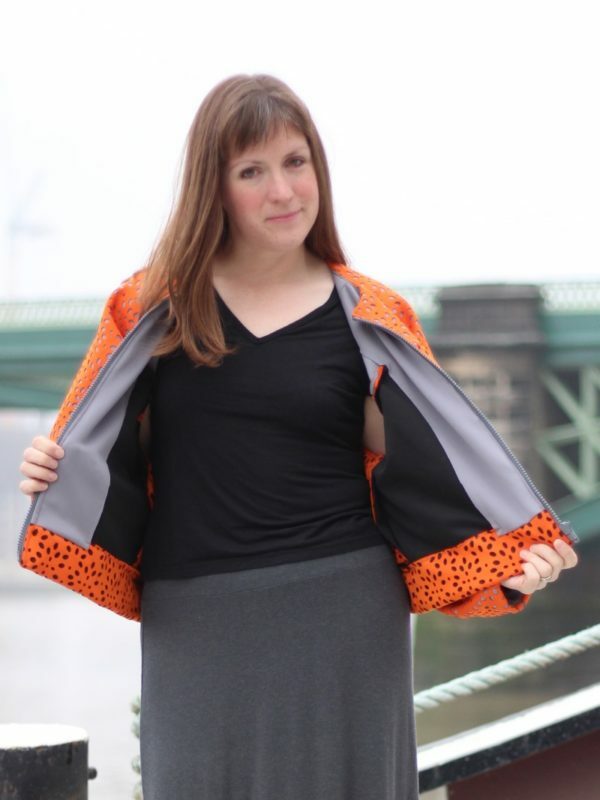 I’ve paired it for the photoshoot with my Ina maxiskirt purely because we were going to a Sikh temple directly afterwards for two friends’ wedding blessing, but it works really well over jeans, and I suspect it’ll be great for cycling too – you can’t say this isn’t a highly visible jacket! So thank you, Rosie, for giving me the opportunity to step outside my comfort zone and choose a fabric that I wouldn’t normally buy, plus the excuse to sew up a pattern from a fantastic indie pattern company that I’ve been wanting to make for months. 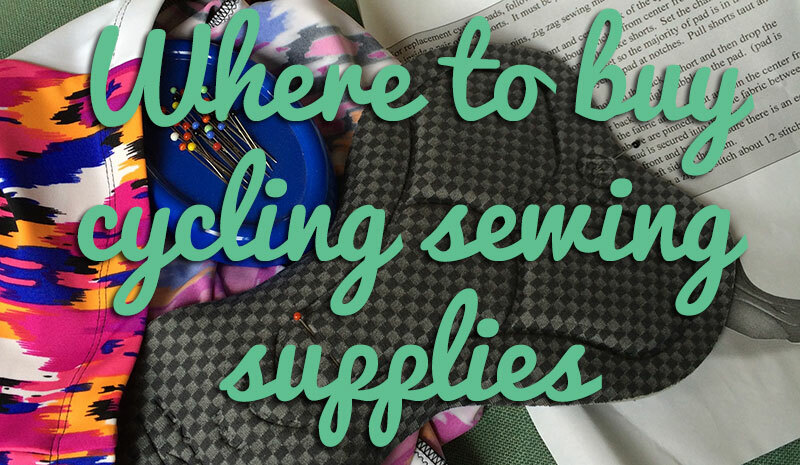 Even though this is the last day, I really hope my #sewdots has helped you “raise lots“! 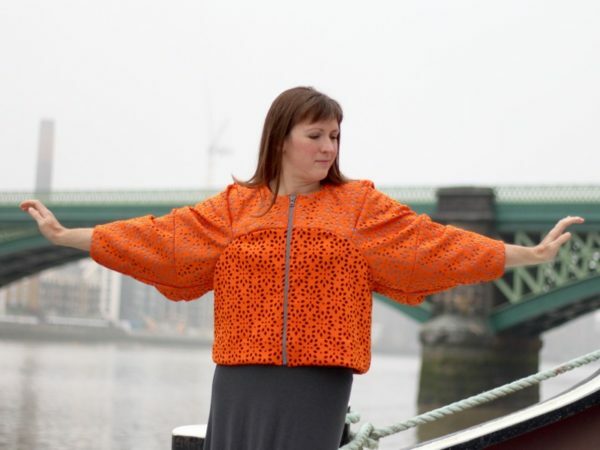 Separator image Posted in Gallery and tagged with jacket, knit, pattern-fantastique. Really cute and quite unusual! Such Crazy Sleeves! My practical slim-sleeves-loving self would be driven insane by the volume, but I think you can pull them off. 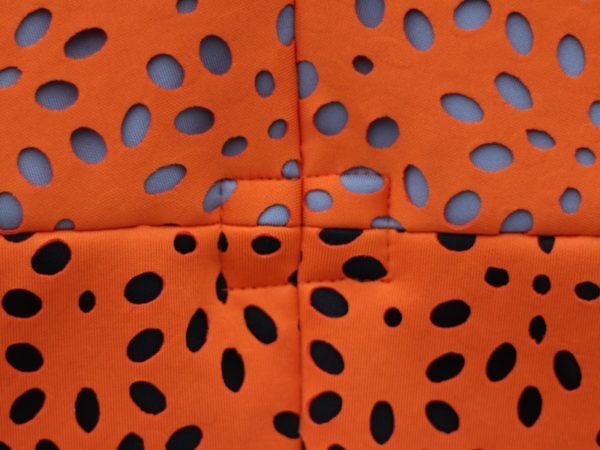 The orange fabric is awesome too! thanks! I wasn’t sure how I’d get on with them in real life since I hate wide sleeves on things like dressing gowns (always getting caught on everything!) but because these are close fitting at the wrist, I absolutely love wearing them! Thanks so much! I saw the fundraising went over its target so hopefully Rosie will do another. It is a surprising fabulous color for you. You look great and I love the jacket with the beautiful gray skirt. Terrific outfit. WOW Thank You for sharing! Looks awesome. 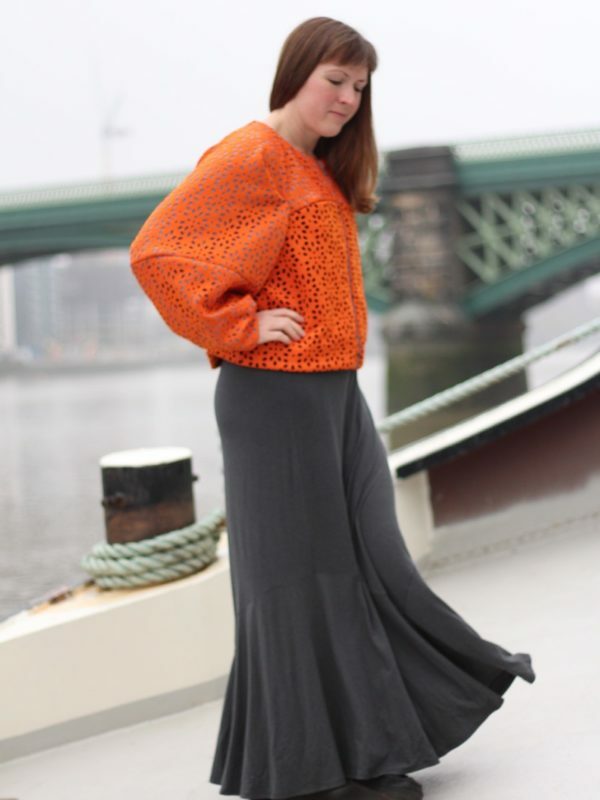 The scuba looks so good and its a winner with your skirt. For all its volume it’s a surprising practical wear. I wore my wool one all winter. I have just swapped out for my denim versions. thanks so much for designing such an awesome jacket! I can’t wait to have a wool one in my wardrobe too. But now that you mention denim, I do have an amazing denim with white stitches in an ombre border print… hmmm. I’m still getting over the idea of eyeball injections and I hope that this fundraising initiative was a great success. 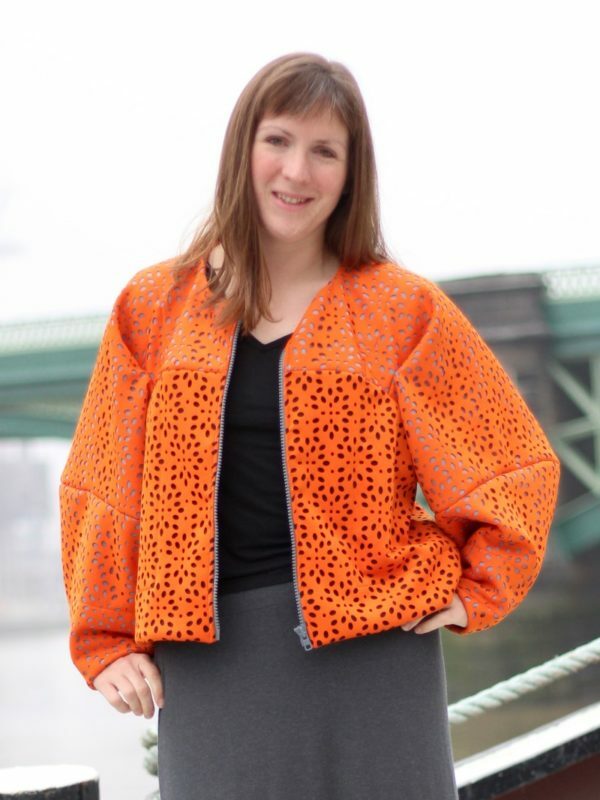 I love your jacket, it is kind of crazy, but looks very cool and designer-y and the fabric / pattern combo totally works. I still don’t understand how that pattern piece is a sleeve or how you made this jacket from 1m of fabric, each sleeve looks about that much! I’m quite curious about this pattern now and am off to google other versions. thanks so much! Yeah, the laser cut scuba was thankfully really wide so I could fit both sleeve portions across the fabric even when it was folded. I just got lucky! I love the jacket. 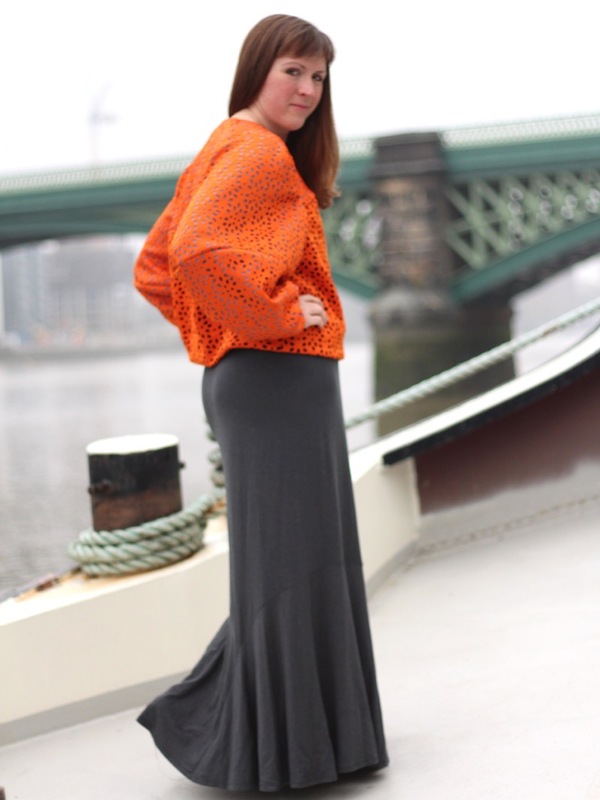 With your Ina skirt it makes a very elegant ensemble. Don’t you just love what we can do when we sew? oh wow, that toothy fabric is incredible! !